Congratulations to Tanner Nelson who won Sterling Scholar for his area!!! Way to go Tanner! Congratulations to the following students who move on the the finals!!! Be there 30 mins before your scheduled time. Good luck! Parking, doors, and general info click here. 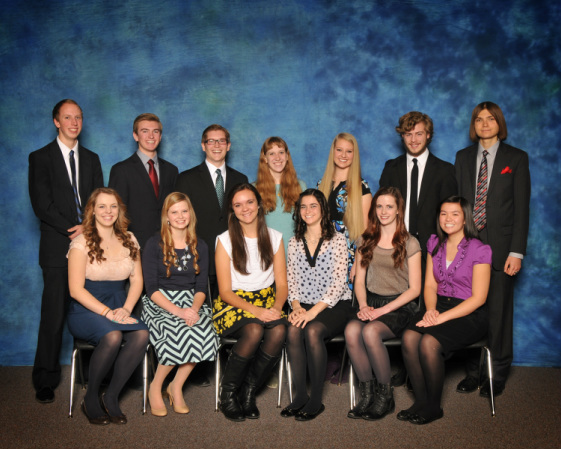 Wednesday, March 12, 2014 – 53rd Annual Deseret News – KSL Broadcast Group Sterling Scholar Awards Ceremony at Cottonwood High School, 5717 South 1300 East, Salt Lake City, 7 p.m. No tickets are required and there is seating for up to 3,000. What is truly marvelous about the Sterling Scholar Awards Program are the scholarships offered by Utah’s colleges and universities and BYUI to the different levels of Sterling Scholars. Since the state is divided into 5 “Regions” there will annually be 5 Regional Winners in the Computer Technology category, in the Dance Category, in the Mathematics category, etc. The same goes for the “Regional Runners-up” except then we have 10 Regional Runners-up statewide per category – 2 from each region. The Wasatch Front Region is the only one that has a semi-final and finals process. The other 4 regions have 14-19 schools within their regions with anywhere from 70 – 200 students participating within their regions – extremely doable as regards all being interviewed. They also have their awards ceremony on the same day as the judging and interviews. So as to the finals and semi-finals standing – that is only applicable to the Wasatch Front Region. The scholarships offered by the colleges and universities listed are offered to all Sterling Scholars across all five regions and are the same regardless of which regions the Sterling Scholar comes from.